Middle English is a student guide to the most influential critical writing on Middle English literature. A student guide to the most influential critical writing on Middle English literature. Brings together extracts from some of the major authorities in the field. 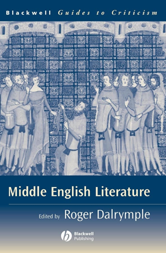 Introduces readers to different critical approaches to key Middle English texts. Treats a wide range of Middle English texts, including The Owl and the Nightingale, The Canterbury Tales and Morte d'Arthur. Organized around key critical concerns, such as authorship, genre, and textual form. Each critical concern can be used as the basis for one week's work in a semester-long course. Enables readers to forge new connections between different approaches.